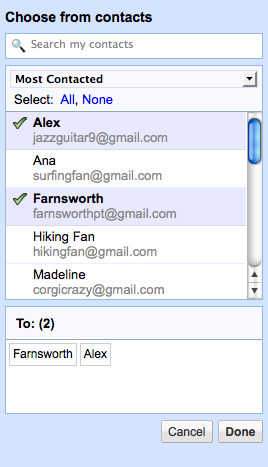 Contact Chooser Lets You Compose Your Mails Easier ! Whenever you are supposed to send mails from Gmail to your beloved ones you use Auto Complete feature for adding gmail-introduces-auto-complete-feature-for-labs/">recipients. You can feel easy with Auto Complete but still there is guiltiness when you look at the list of your contacts and you want to send the mail to the list too. To solve this guiltiness here is another feature that has been added and called Contact Chooser. Just click the “To:” link or Cc:Bcc whenever you want to send the mails, then you can see something how-to-send-sms-via-gmail/">like this. If you will choose contact groups, the groups will be appeared in a drop down menu in the search-google-in-reverse-order-funny-experience/">contact chooser, therefore you can select contacts from the groups already have been created. Moreover, if you want to use your contacts groups in other languages like Chinese, Japanese and Korean, you can do it. But gmail-makes-unread-messages-more-easier-for-mark-as-unread/">unfortunately, you will never have the Auto Complete option as per you type.